We are witnesses to an interesting movement: the 3D-printing, or additive-manufacturing (AM) process for building things. 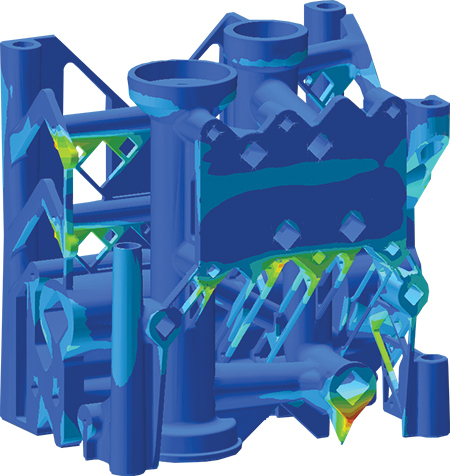 As we watch it progress from just another technology hype to the next industrial revolution, one thing becomes very clear: Simulation tools that would allow us to get the parts ‘first time right’ are very much a prerequisite for AM to really take off. According to a December 2014 National Institute of Standards and Technology (NIST) report, a particular metal part made from aluminum alloys would cost approximately $3 via traditional manufacturing and approximately $29 via AM using selective laser sintering—a ten-fold cost increase. Part performance—check for the structural integrity of a part based upon both the design and the manufacturing process. Include simulation of the hot-isostatic-pressure process to reduce residuals stresses in the part, ensure that there is no porosity, and simulate the cutting process, which while removing the support structure may also remove needed stiffness. So who is the engineer that can make sure that when the part is sent to the machine, it will come out perfect? Is it a CAD designer who will learn new skills in simulation and manufacturing? Is it as simulation analyst who needs to take on a greater role in initial part design? I think that this superhero will come from both areas, but one thing is clear: It has to be someone with a flexible mind and who thrives on learning new methods.